I’m still here! And still 657 weeks pregnant. Okay, okay–38.5 weeks. But it feels like a lot more! While we’re anxiously waiting on our last sweet girl to decide to make her grand entrance, I’ve been busy getting things around the house ready for her imminent arrival. We were giving the girls a bath the other night and I realized that Chloe was still using our hooded baby towels. Since we’ll have a much smaller person needing them very soon, I needed to get her new bath towels. 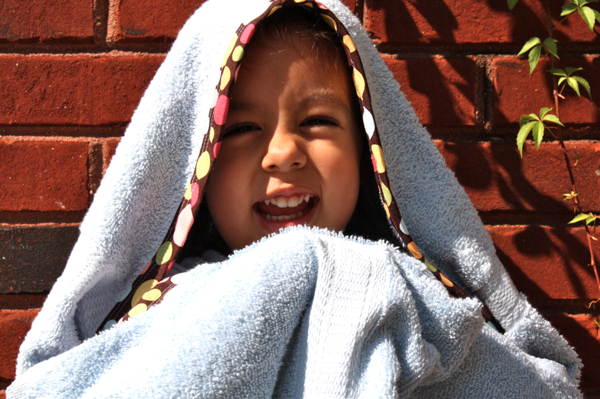 Sofie uses a hooded towel someone gave us, and though I think it’s meant for the pool or beach, we use it for bath time. And she LOVES it. 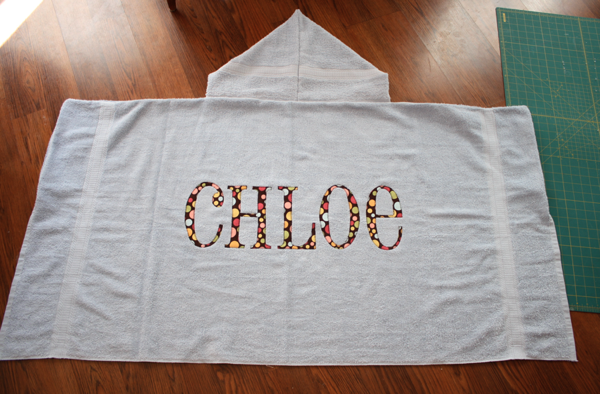 So I thought Chloe needed her own big girl hooded towel, too! 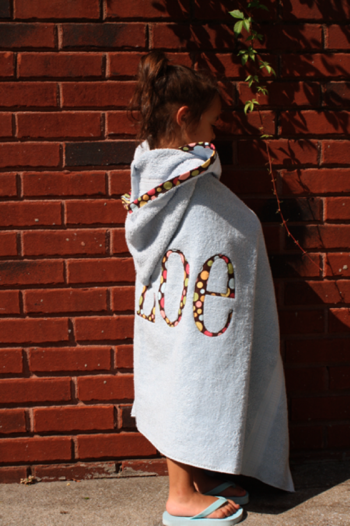 I made it in the same style Sofie’s was done in, but personalized for my little honey. 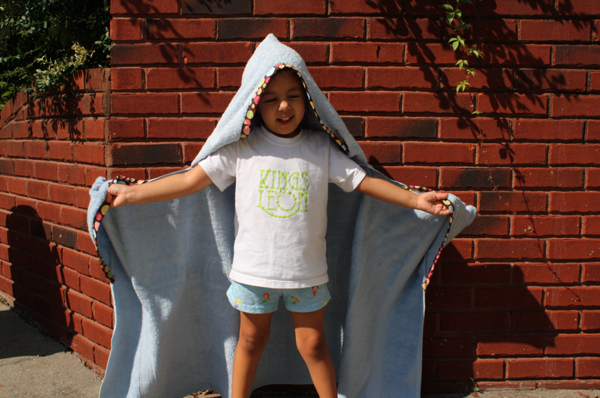 I got Sof to model it for me, though, because Chloe’s still super tiny in it (and was napping during the photoshoot). Sofie’s towel also has these great little hand holds that make it easy for her to wrap herself up to stay warm, so I included them, too. Which are perfect for matador practice! But really, they make the towel nice and snuggly. 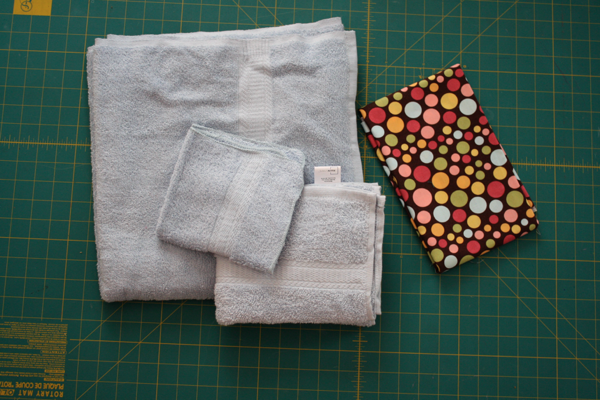 The towel went together really quickly and I’m tickled with how easy it was to do! 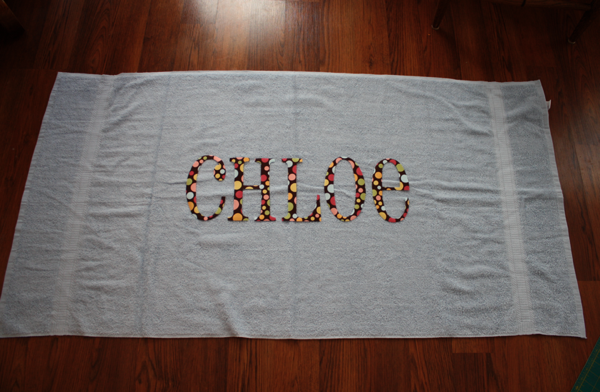 The very first thing I did was applique Chloe’s name on the back. 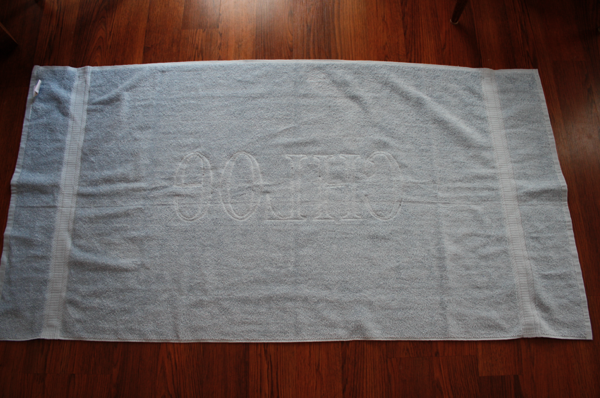 The letters are 7″ tall and they’re 10.5″ from the bottom of the towel. 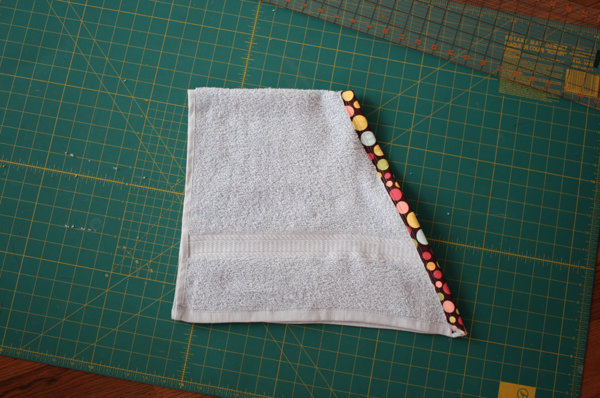 I have 2 helpful applique hints for this towel. 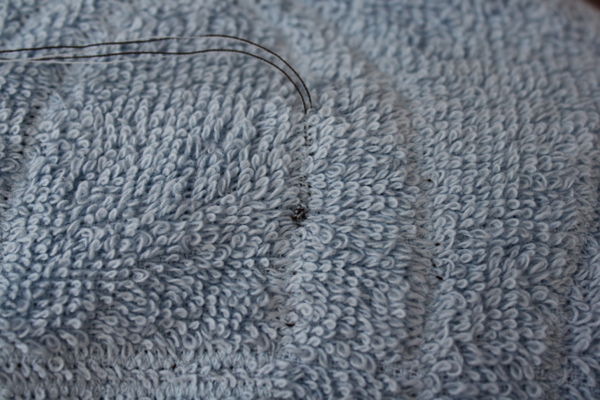 First, use thread in your bobbin that’s the same color as the towel so the stitching isn’t obvious. Second, when you tie your threads on the back, thread them on a needle and feed them through your stitches about an inch, then cut off. That way you still have the length to keep the knots tied, but the leftover thread is hidden in the stitches and not sticking out. I’m not a fan of the hooded towels that have bias tape all the way around them. Who wants to sew all that? So I figured out a way to do it with minimal bias tape. I made my own from the coordinating fabric, but you can use store-bought if you wish. I made 2 yards of bias tape. 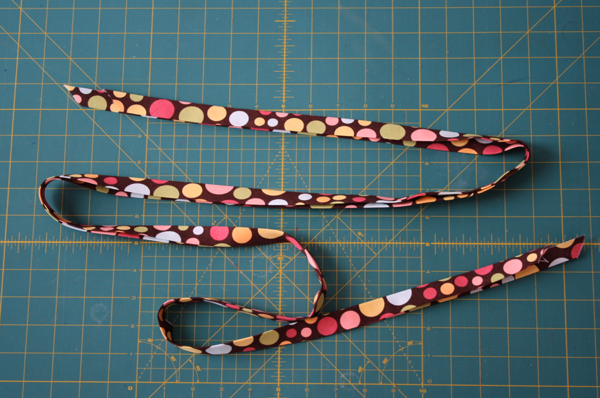 I cut it 3″ wide so that when it’s finished, it’s 3/4″ wide. Then I cut the washcloth for the hand holds. 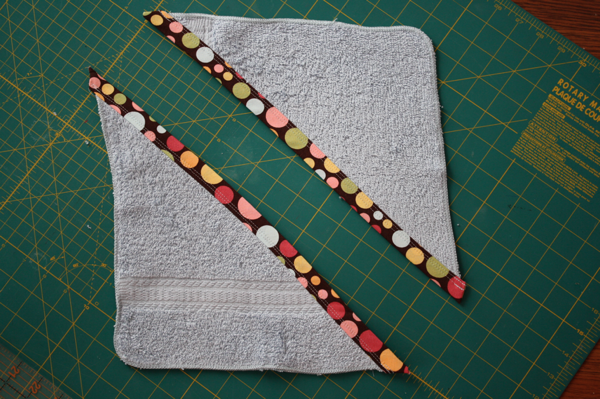 I cut diagonally from corner to corner, leaving about 1″ in the middle that had the rounded ends that I didn’t want. 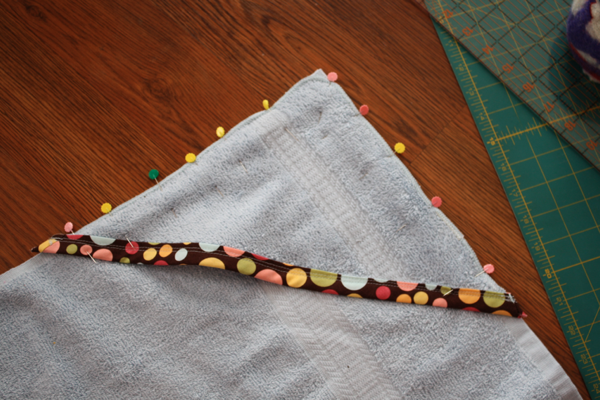 Then sewed the bias tape to the cut sides. 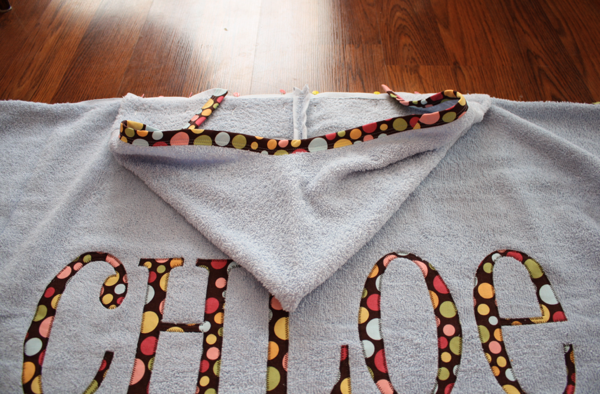 I took the triangle pieces and laid them right side down on the back side of the towel (the side with the applique) and matched and pinned sides, and sewed them on. 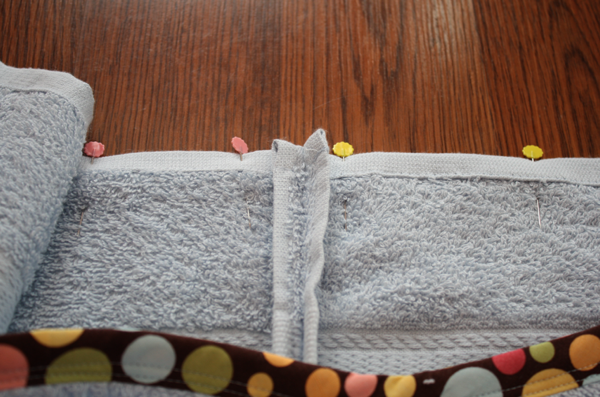 Then flip them inside out to hide the stitching and get them on the side of the towel you need them on! To make the hood I took the hand towel and folded it in half. I measured 6″ in on the fold and cut diagonally to the outside corner. 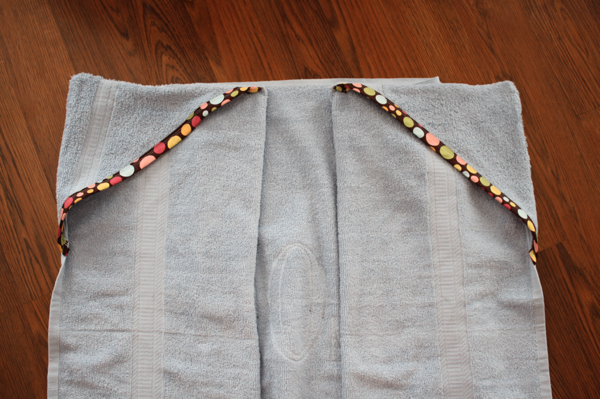 Then sew the rest of the bias tape to the cut side of the towel. 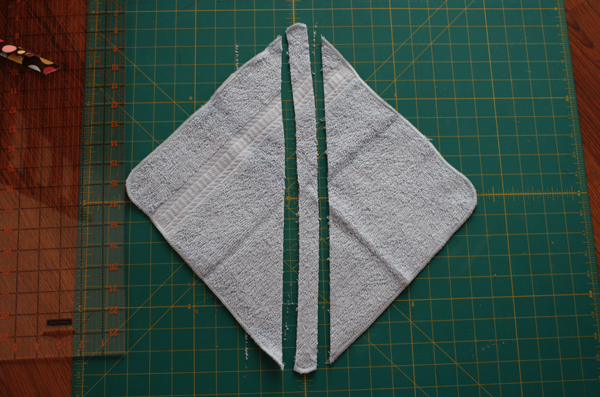 Fold it in half again and sew down the side opposite the bias tape. 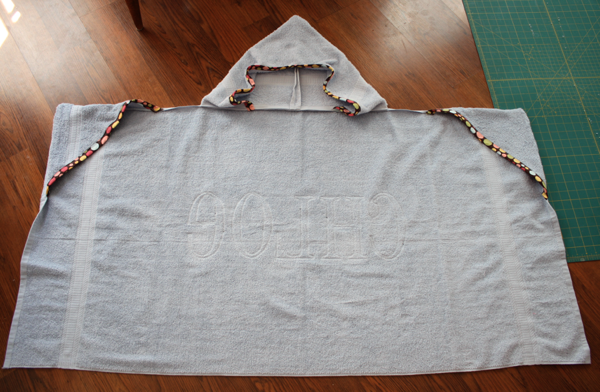 Find the middle of the back of the towel and place your hood seam on it. Pin the hood on. You can either lay the hood out flat along the back of the towel, or do like I did and fold it in some to close it off more. 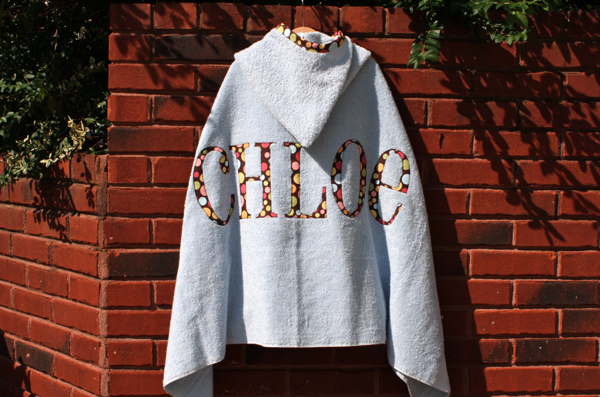 Sew the hood on and you’re finished! So cute it makes me want one for myself! Great tutorial! 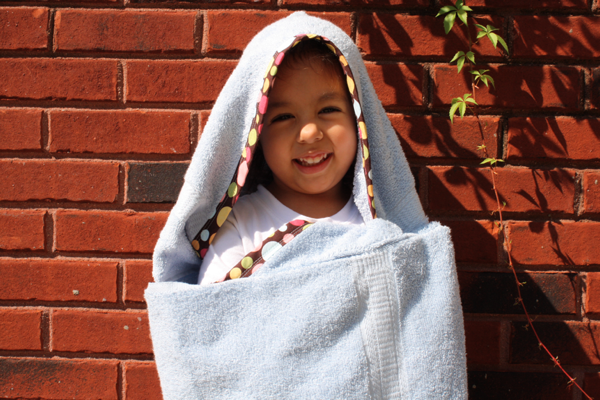 I have a toddler I’m still trying to squeeze into a baby towel and a big sister who could probably use a towel upgrade, but I balk at PB’s prices for hooded towels. Perfect tutorial and perfect timing. Thanks! P.S., good luck and godspeed with the rest of your pregnancy! Cute towel!!!! I am going to give your make up bag a try !! I like its shape. Great tutorials, I enjoy reading them!! Excellent! I made one without the hand pockets and didn’t even think about doing that! I’ll have to do some retrofitting. 🙂 Thanks!! Can you list some of the cute fonts you use? 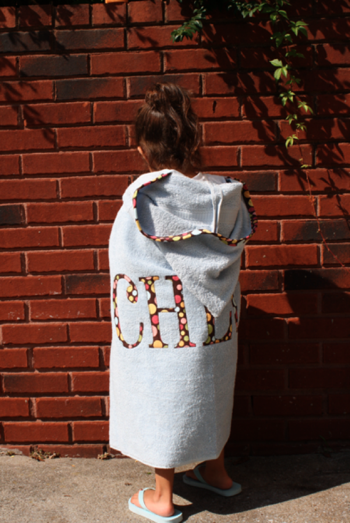 I have used cheri before and love it, but what did you use for Chloe’s towel? Thanks so much and love your stuff! You have inspired me! Thank you Amanda! 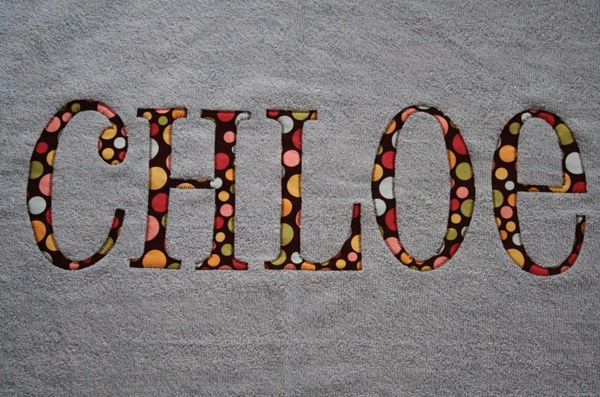 For Chloe’s towel I used a font called “Pharmacy” that I use for lots of projects! I will check it out. Thanks so much for your response! I know how busy you must be with a new baby and all. And I’m so glad that you and your family are all ok from the car accident. How scary! 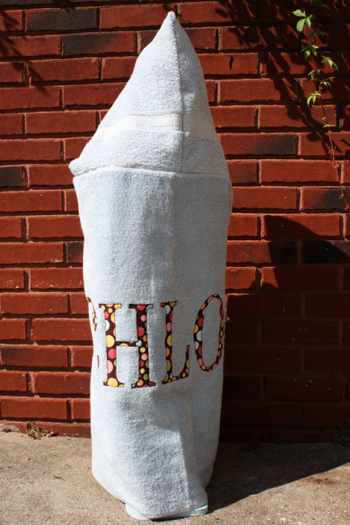 I just got done making this towel for my daughter following your easy directions. It was also my first time to applique anything. I am very pleased and can’t wait till morning so she can try it out. 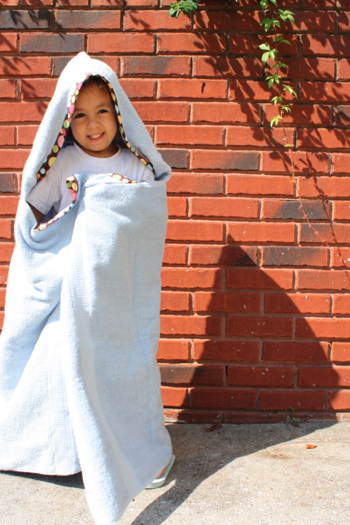 She is about to turn 3 and is going to love a BIG Girl towel. It will probably swallow her, but much better than the baby towels I’ve been using. Thanks for your wonderful blog. im new to this but i am trying to down load the font from the website and it just copies the whole page…..am i doing this wrong? Thanks!!! I needed a different idea for a baby shower gift. 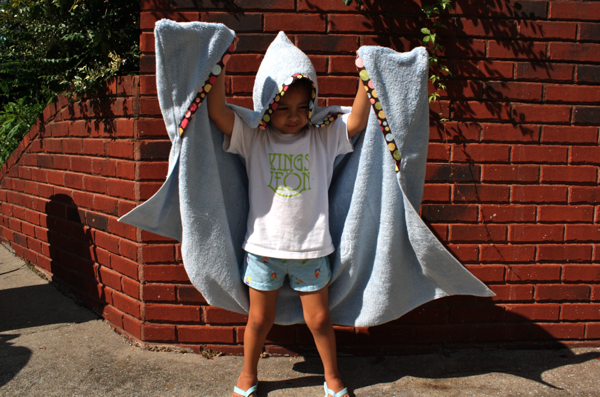 I found your site and made the hooded towel. I LOVE IT !!!!! AND it was soooo easy to make. I now have been asked to make another one for someone to give as a Christmas gift. Thank you for sharing. Just wanted to say thank you so, so much for this! 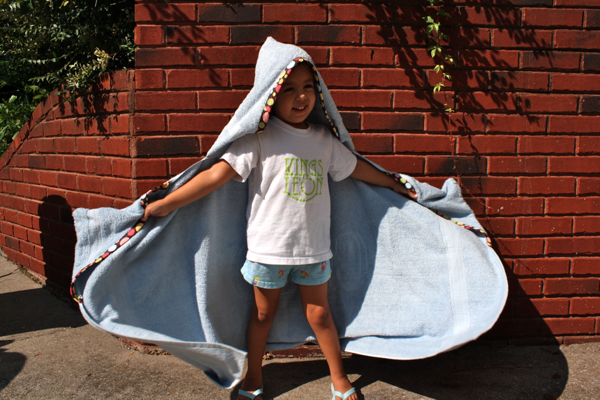 Using it as a template to make a hooded blanket that will be part of a flying squirrel Halloween costume! Love this! Thank you SO much for sharing. 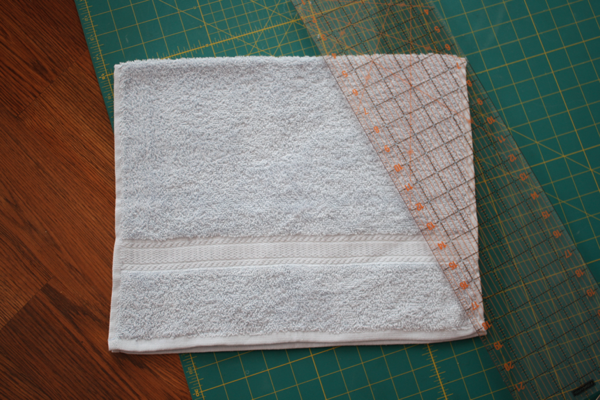 I’ve made a few of these now, and I have one question… How does your bobbin thread not bunch up while sewing the towels (terry cloth)? No matter what I do, the back is all ugly. Thanks! Excellent tutorial, just what I have been looking for. 10 grandchildren to make these for so better start soon ready for christmas! Hi i love it . I need HELP i cant fit the hood and the towel under my machine do you have any tip or tricks.. Try stitching them right at the edge where the towel is bound? They’re usually not so plush there and will fit better. Hi Rhea! 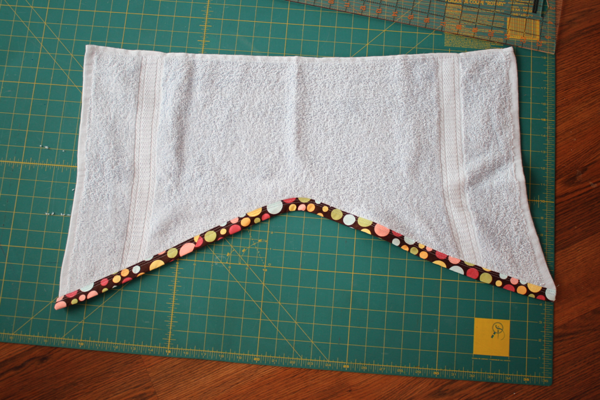 I either serge the ends, or I tuck the bias tape in on itself and sew it together.